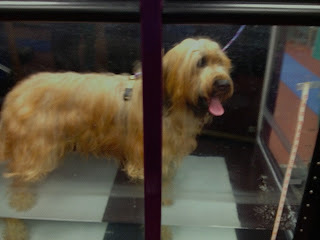 Chou went to underwater treadmill with laser therapy today. It was the last of her initial package of 10 sessions, so it was time for new muscle measurements, to see if she is improving. She is! Her hind muscles are almost in the normal range now. She has made great improvements in strength and stride. That matches what I have seen in her movements and attitude. She is a bouncy, happy puppy with a waggly tail. She had her laser therapy, then ran into the treadmill, anticipating all the treats that would be dangled in front of her as she ran, and trotted for 35 minutes at about 3 mph. Then she came out energized and squirmed as we tried to dry her with towels. She ran around the room, plucked something out of a wastepaper basket, jumped on her physical therapist (and grabbed at her scrubs ties, nearly pulling down her pants), and then it was time to go home.